The Lava Xolo Q600 has just popped up in India sans an official launch and it has already been put on sale for a budget price. The Lava smartphone falls in the same category as the recently unveiled Micromax Canvas Lite and the Gionee Ctrl V4, considering just the price. On a side note, Micromax is expected to launch a new flagship next week, with details of the phone (except the price) already having been leaked. The Lava Xolo Q600 is yet to surface on the company’s official website, so details are limited to what are available via Snapdeal. On the bright side, most important components have been listed out. Instead of a 5-inch touchscreen, the company has opted for something slightly smaller. The Lava Xolo Q600 is fitted with a FWVGA 854 x 480p resolution panel on the front which spans 4.5 inches wide. Accompanying it is a VGA webcam for conducting video calls. The standard dual SIM support is provided with this handset as well, but there’s no mention if both slots support 3G HSPA or not. While there’s no information on how much the phone weighs, the dimensions read as 133.5mm x 67mm x 11.9mm. 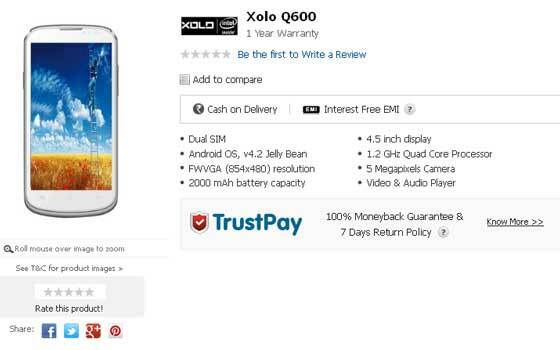 The Xolo Q600 is available for purchase on Snapdeal for Rs 8,749. It’s currently being offered in white and with EMI options of 6 and 3 months.